"Do we have the courage to welcome with tenderness the difficulties and problems of those who are near to us?" the pope asked. 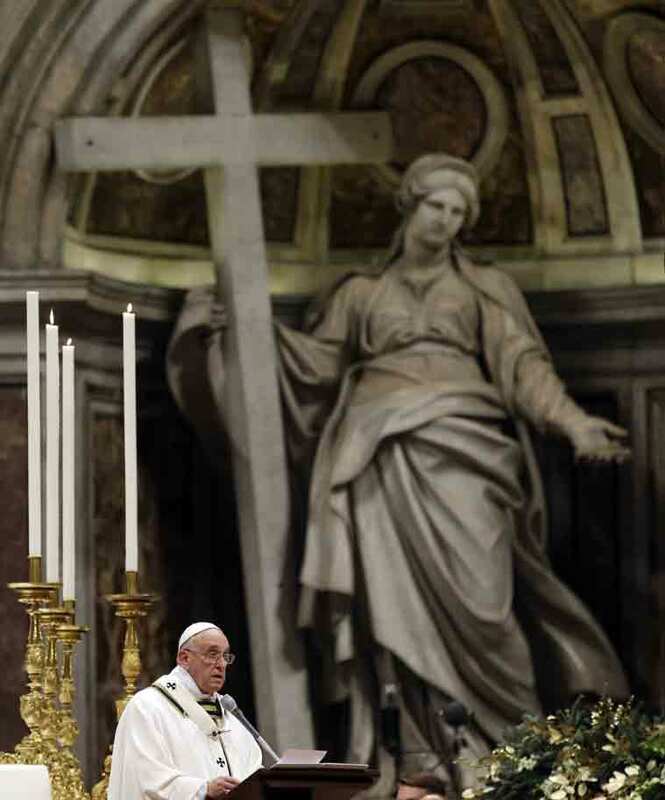 Pope Francis led Christmas Eve mass in the Vatican calling for “tenderness” and “warmth” after a violence-plagued year as millions of Christians began marking the holiday. The Argentine pontiff’s brief homily was replete with Gospel references in his Christmas Eve mass, broadcast live in 3D for the first time. “Do we have the courage to welcome with tenderness the difficulties and problems of those who are near to us?” the pope asked in Saint Peter’s Basilica, filled with some 5,000 worshippers. “Or do we prefer impersonal solutions, perhaps effective but devoid of the warmth of the Gospel? How much the world needs tenderness today!” he said. The leader of the world’s 1.2 billion Roman Catholics also called on “the arrogant, the proud… (and) those closed off to others” to meet life “with goodness, with meekness.” Ahead of the celebrations, the pontiff voiced concern about the growing persecution of Christians, some of whom he said had been “brutally driven out” of areas where they have lived since New Testament times. Francis delivered a Christmas message via telephone to refugees displaced to Iraq’s Kurdish autonomous region. “Dear brothers, I am close to you, very close to you in my heart,” the pope was quoted as telling the refugees by Italian press agency AGI. “The children and the elderly are in my heart,” Francis also told the Iraqi refugees in the Ankawa camp. In Baghdad, Chaldean patriarch Louis Sako said about 150,000 Christians had been displaced by an offensive spearheaded by the Islamic State group, which has targeted Christians and other minorities, with dozens leaving Iraq each day. Iraq’s displaced Christians “still live in a tragic situation and there are no quick solutions for them,” Sako told AFP, saying that particularly this Christmas, they needed reassurances that they “are not left alone and not forgotten”. In Syria, Christians in the war-torn city of Homs were enjoying their first Christmas in three years in the Hamidiyeh neighbourhood, with a brightly coloured tree and a manger made from rubble set up in the middle of the ruins. “Our joy is indescribable,” said Taghrid Naanaa while picking out tree decorations at a shop in the district, which the Syrian army recaptured from rebel fighters this year.